Playtech is right up there with the best of the software developers creating new slot games. So when they decide to put their own spin on the best Irish slots online today, you know it’s worth a look. Their effort is called the Land of Gold slot, but will it send any riches in your direction? The Land of Gold slot is an unusual-looking slot from Playtech that features five reels and 576 ways to win, instead of providing you with the traditional paylines. The three central reels have four rows in each, while the first and fifth ones have just three positions on each. There are sunny skies and even some toadstools settled in around the reels on this game. ‘Spin’ appears on a chopped-down log, so everything is set up quite nicely. If you’re used to the standard 5 x 3 layout, this one might be a tad confusing to start with. however, the paytable explains a bit more about the layout and you’ll soon be spinning like a pro. While the Irish theme is very much in evidence here, it doesn’t appear to be quite as heavy-handed as it is in other slot games. That might appeal to you more than some of the contributions to the theme from other software providers – especially given the more unusual layout. Let’s explore, shall we? The graphics are just fine, with a few messages about game features appearing along with the title at the top of the game screen. The progressive jackpot is shown to the top left, while the main controls are all set out quite neatly at the bottom. It certainly won’t take you long to start spinning with confidence. The reel spins are very smooth, with each reel starting to spin in turn. Additionally, when you get a win, all the non-winning symbols are greyed out so you can see which ones did give you the win. Click on the toadstool to the bottom left and you’ll see the paytable appear. The first page reveals the symbols that can appear. The main ones are predictable but nicely drawn, with a pot of gold, a rainbow, a four-leaf clover, a horseshoe and a golden harp as the main symbols to match up. You also get the basic A, Q, J and so on appearing. There are three other special symbols appearing as well (yep, we’ve not forgotten the leprechaun), and we’ll focus on those in a moment. But the pot of gold is the most valuable of the general symbols, offering 1,500 coins for five. 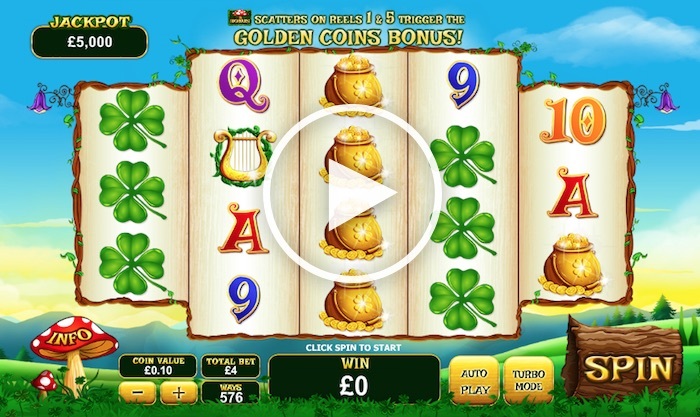 Right – let’s see what the Land of Gold Playtech slot can offer, shall we? Leprechauns often have a special power in these Irish-themed games, and here he takes up the role of the scatter. He’ll only ever appear on reels two, three and four, but he can trigger some Lucky Spins free games when he appears on all three of those reels at once. The free games you can win are unlimited in number. You’ll see a Wheel of Luck and you have to spin to win free games and multiplier values. You get to keep on spinning until the green pointer on the right settles on one of the two collect messages. If you play some free games and the leprechaun appears on those three reels again, you’ll win a further five free games. Meanwhile, the Land of Gold slot title card is the wild and appears with the usual rules in that it replaces absolutely everything apart from the wild and the bonus symbol. Did we say bonus symbol? We did. It’s a toadstool, and when it appears on reels one and five you enter the Golden Coins bonus. The leprechaun will jump and catch as many gold coins as possible. Three lucky clovers caught will bag you that progressive jackpot. The game also has a Stacks of Luck feature. Any of the five higher-paying symbols can appear stacked on reels two, three or four. This could win you from 5x to 25x the triggering bet, with the chance of a random cash prize too. You’re not betting on lines here, but the minimum bet is calculated as if there were 40 paylines in action. With a minimum coin value of 1p, you can get started with as little as 40p wagered on each spin. If you want to increase that you can do, to as much as £80 per spin. The overall return-to-player is calculated as being around the 95.15% mark. This also includes 1% that goes towards funding the Clover Jackpot. 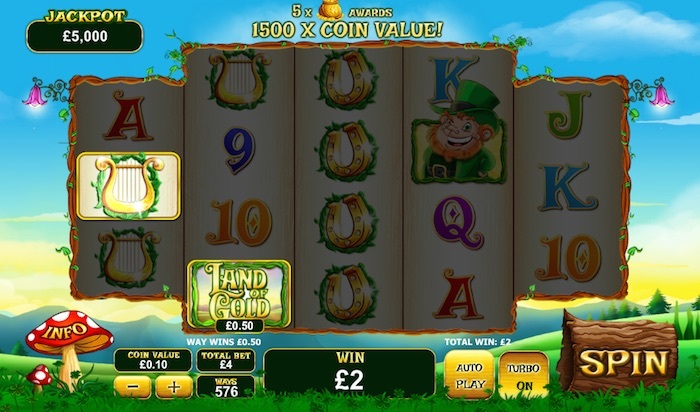 It’s not hard to find the latest Irish-themed slots online. But the big question is how close to the number one position the Land of Gold slot manages to get. In our opinion, the bonus features in this slot make it one of the best… but try it for yourself to see if you agree.